THOOTHUKUDI/MUMBAI India—One person died and others were wounded by gunfire in southern India on Wednesday in fresh violence related to protesters’ demands that a copper smelter be shut on environmental grounds. The day before at least ten people were killed by police during a mass demonstration against the plant. As the struggle continued on the streets of the port city of Thoothukudi, located at the tip of the subcontinent in Tamil Nadu state, an Indian court ordered a halt, at least for a few months, to plans to double the size of the plant. The Vedanta Resources-run smelter is already one of the two biggest in the country. The Madras High Court told authorities to hold a “mandatory” public hearing over Vedanta’s application for environmental clearance and said a decision on environmental approval would be looked into by “appropriate authorities”. “One person was brought dead today, and up to eight cases of injuries due to gun shot are undergoing treatment,” said a doctor in charge of the casualty ward at Thoothukudi government hospital. “The situation is tense, but under control,” said an official at the Thoothukudi police control room, who did not wish to be named as he was not authorized to speak to the media. Shops and ATM were shut and vehicles stayed off the roads on Wednesday amid patrolling by police vans. Charred vehicles could still be seen on the deserted roads with hundreds of policemen stationed outside the government hospital. The city’s Eral Bazaar, which is usually bustling with economic activity on a regular day, was almost deserted late evening. “Vedanta shall cease construction and all other activities on-site proposed Unit-II of the Copper Smelting Plant at Tuticorin (Thoothukudi) with immediate effect,” the order from the Madras high court said. “Truth and reasoning have prevailed,” said Fatima Babu, who had petitioned the court. 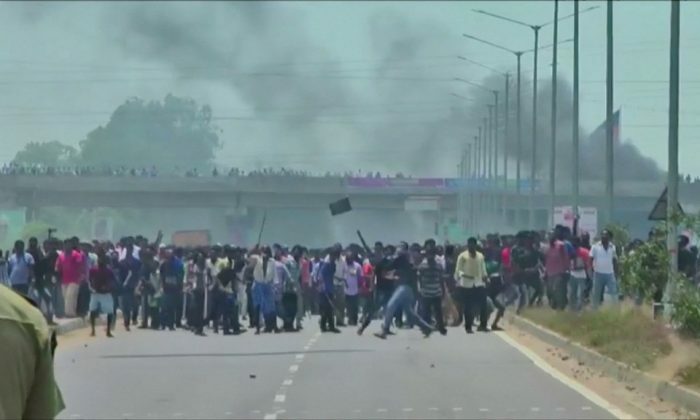 Vedanta says the protests were based on “false allegations”. “We are shocked and saddened to hear about the incident and we are working with the relevant authorities to ensure the safety of our employees, facilities and the surrounding community,” said Kuldip Kaura, CEO of Vedanta Resources during a call with reporters. “Copper contributes almost 7-8 percent to the consolidated operating profit and as much as 30 rupees (44 cents) to the share price, therefore it definitely hurts the company’s numbers,” said Goutam Chakraborty, analyst with Emkay Global.